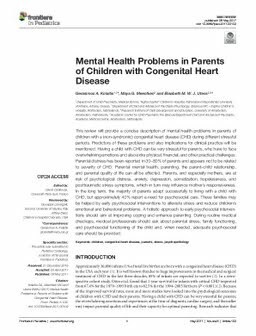 This review will provide a concise description of mental health problems in parents of children with a (non-syndromic) congenital heart disease (CHD) during different stressful periods. Predictors of these problems and also implications for clinical practice will be mentioned. Having a child with CHD can be very stressful for parents, who have to face overwhelming emotions and also extra physical, financial, and other practical challenges. Parental distress has been reported in 30-80% of parents and appears not to be related to severity of CHD. Parental mental health, parenting, the parent-child relationship, and parental quality of life can all be affected. Parents, and especially mothers, are at risk of psychological distress, anxiety, depression, somatization, hopelessness, and posttraumatic stress symptoms, which in turn may influence mother's responsiveness. In the long term, the majority of parents adapt successfully to living with a child with CHD, but approximately 40% report a need for psychosocial care. These families may be helped by early psychosocial interventions to alleviate stress and reduce children's emotional and behavioral problems. A holistic approach to early psychosocial interventions should aim at improving coping and enhance parenting. During routine medical checkups, medical professionals should ask about parental stress, family functioning, and psychosocial functioning of the child and, when needed, adequate psychosocial care should be provided.